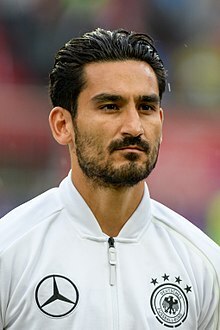 İlkay Gündoğan (German pronunciation: [ˈʔɪlkaɪ̯ ˈɡʏndoːan] ( listen), Turkish: [ˈilkaj ˈɡyndoɰan]; born 24 October 1990) is a German fitbawer who plays as a central midfielder for the club Manchester City an the Germany naitional fitbaw team. ↑ "Ilkay Guendogan". bvb.de. Retrieved 13 April 2014. This page wis last eeditit on 15 Julie 2018, at 19:15.